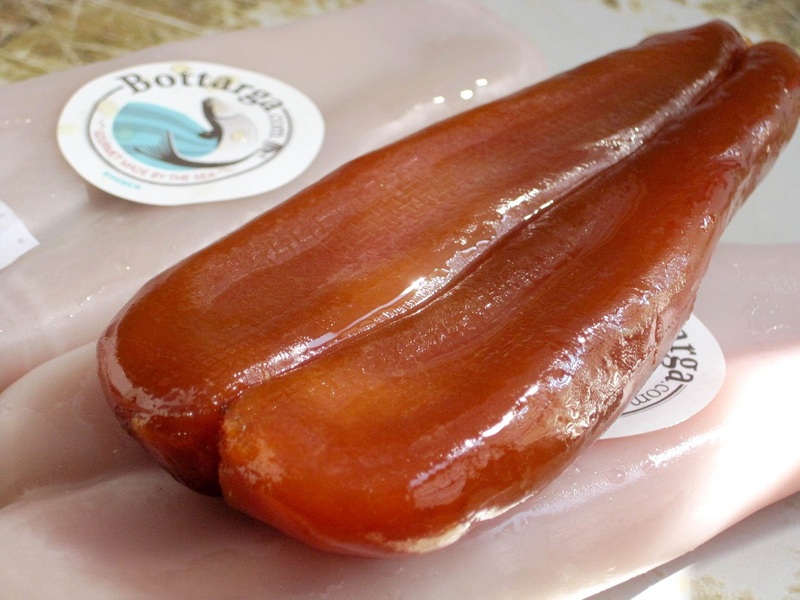 Bottarga Fish roes, are fish roes pickled and dried and covered with wax. This dish is popular in the Mediterranean region. There are some that tend to eat them after the cooking process and there are some who eat them uncooked. The origin of the fish roe is from different fish: Tuna, Hilsa fish, cod, carp, mullet, herring, and salmon. Golden fish, flying fish and sturgeon fish. To prepare the Bottarga: after fishing the fish, you need to take out of the mullet or the tuna the sac with the roe. Spread coarse salt over them generously and spread them between two pieces of old wood like a sandwich. The next stage, put weights upon the wood in order to flatten the sacs, that within several day reach the thickness of 4 cm. You remove the pieces of wood and the weights and let the roe to dry under the sun until they get a bright orange color. Fish roe have different names from different countries: In Italy the fish roe are called Bottarga. It is common in Italy to grate the Bottarga or slice them into thin slices and spread over pasta or use the Bottarga as sauce for pasta. To the pasta you can add: cheese, spices, meat and of course: fish roe. Making it very tasty and special to those who love a strong and unique flavour. The dish that is most popular in the south of the country, as part of the Sicilian cuisine and the Sardinian cuisine. Our recommendation is to spread Bottarga over fresh pasta. Green pasta (basilica), orange (pumpkin) or red (dried tomatoes), the base of the pasta adds to the spiciness of the dish. This dish is considered the main dish in a lot of expensive restaurants. The Slovakians call the fish roes Botargo. The north African – Adam thread. The name Bottarga origins from the Arabic – Bott-a-ric In France: poutargue or boutargue, it is customary to eat the boutargue together with a toasted baguette. The Bottarga of the mullet is considered finer then the tuna one, but both are amazing in flavour, when they are sliced and eaten with bread or grated over pasta. Other names from different origins: Adam thread, Adam thread, abode, Rahou and Botrado.